In 1973 Diane Von Furstenberg introduced her wrap dress. 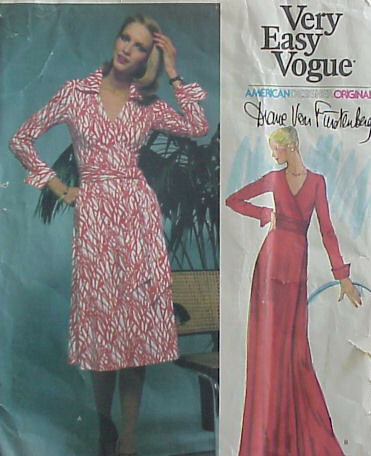 She created some patterns of her designs for the Vogue pattern company around the same time. The dresses where a big hit in the 70's died out in the 80s, and seem to be having a come back now. 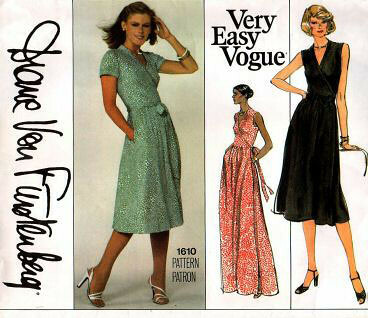 You can find these patterns: Vogue 1548 (the cow print), Vogue 1549 (the small red one), Vogue 1610 (the green one), Vogue 2517 (the 2 color one) on ebay. These patterns end up in a bidding war. I've run into Vogue 1549 few times. I've had it for sale on my companies website several times. My guess is that was the popular pattern in the 70s. It makes sense. 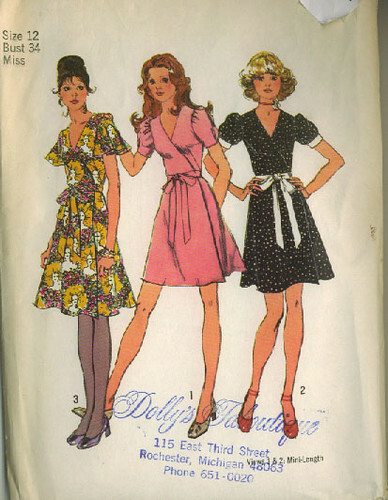 If everyone went out and bought the pattern, you would have some of them left over in the sewing pattern collections, later on. I've seen these patterns sell for around $70 on ebay. If you are lucky, you might find it at a thrift store. I have been looking in the clothing stores and these stretch knit dresses are all over the place. 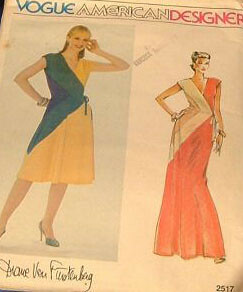 If you want a modern version of this dress, and don't want the original DVF pattern- try Kwik Sews 3408. You can also find similar patterns like these from the 70s. Here is an pattern from 1971. This is Simplicity 9799: a wrap dress for knit or woven fabric. This pattern was produced 2 years BEFORE the DVF wrap dress - you can see that wrap dresses where already in style, before she did her version of it. The knit dresses we have in the stores today are our own spin on the similar fashion. Either take an original 70s pattern, or work with a new one that is out in the stores. Have fun with them now - make them your own! Apron dresses - a dress, a jumper, an apron?